Welcome to the social media age, where if you do nothing and no one sees it, you didn’t do anything. In the days leading up to the game against the Arizona Cardinals, Dallas Cowboys owner Jerry Jones made it very clear that he was not a fan of players kneeling during the playing of the national anthem. 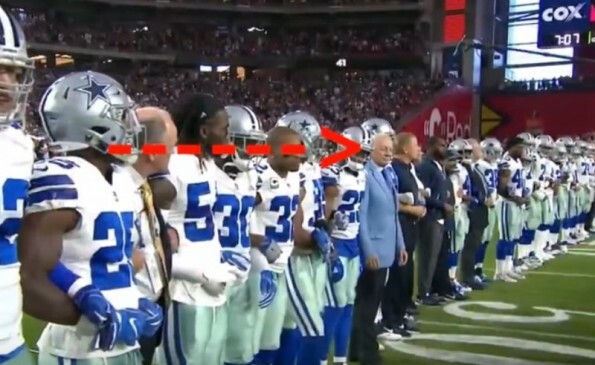 On Monday Night Football, the Cowboys came out onto the field with their arms locked. Then, all of a sudden, they all kneeled BEFORE the actual anthem was set to be played. Just before they kneeled, Jerry unlocked his arms and started looking around for an available cameraman. He spotted one and chased him down to make sure he got the shot of him kneeling.